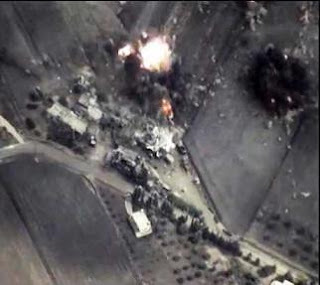 Russia's air strikes in Syria (Pictured) will lead to a further escalation of the conflict, members of the US-led coalition against Islamic State jihadists warned, calling on Moscow to immediately stop targeting Syrian opposition forces. “These military actions constitute a further escalation and will only fuel more extremism and radicalization,'' seven countries including Turkey, Saudi Arabia and the United States said in a statement published on the website of the Turkish foreign ministry. “We call on the Russian Federation to immediately cease its attacks on the Syrian opposition and civilians,'' added the statement, which was also published on the websites of the German and French foreign ministries. It said that Russia should “focus its efforts on fighting ISIL,'' using an alternative name for the IS group. Russia has insisted it only targeted IS in its air strikes. But Turkey and several of its Western allies have said that moderate groups fighting the regime of President Bashar al-Assad were hit. The statement expressed “deep concern'' over Russia's air strikes which “led to civilian casualties and did not target'' IS. The seven countries supporting the joint declaration are Britain, France, Germany, Qatar, Saudi Arabia, Turkey and the United States. It was published following intensive diplomacy on the sidelines of the UN General Assembly in New York which saw Turkish Foreign Minister Feridun Sinirlioglu meet his US counterpart John Kerry late Thursday.